I wasn't surprised that Haley and Phil were in the bottom three with Chris. I predicted that Phil was going to get the boot last week but I was wrong. Chris Sligh did not perform as well as he normally did this week. He was totally not in sync with the tempo. Too bad though because he is one of the more interesting contestants this year. Did you hear what Simon Cowell said? He said he if Sanjaya wins this year's competition he is going to quit! I don't think he has anything to fear. Every year there is one contestant who should have been knocked out early in the show but stayed on week after week. This year it is Sanjaya. Did you know that there are people who are rooting for Sanjaya just because the producers of the show and the general public are against him? Votefortheworst.com, is a site that encourages people to have fun with American Idol and vote for the "worst" contestant in the show. Ok, about this week's show. I think Lakisha, Melinda, Blake, and Jordan sang very well. Chris Richardson wasn't too bad either. The rest, err, so so. Catch all the latest actions at AmericanIdol.com. I was wrong. Phil Stacey made it to the next round of American Idol. Stephanie Edwards did not. I was surprised though that Chris Richardson was in the bottom two with Stephanie. All the judges had very positive feedback on his performance and I myself was quite impressed. Looking forward to the top ten contestants next week! 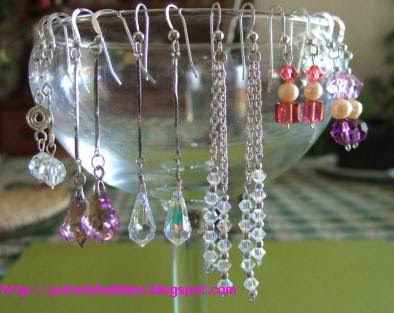 Crystals, Pearls and Sterling Silver make up these ear-rings. 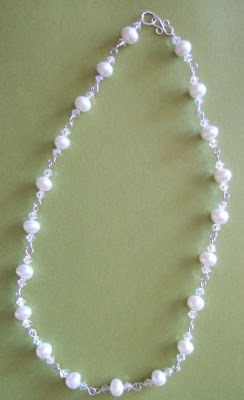 I bought some sterling silver wire and used a 22 gauge for this pearl and crystal necklace. I also made the S hook from gauge 20 sterling wire. PERHAPS it was not just the dress that made Linda Onn refuse to show up to co-host the 79th Academy Awards in Los Angeles. Star TV’s associate vice-president for South East Asia, Nini Yusof, claimed that Linda Onn’s no show was because the radio deejay was just not well-prepared to host the red-carpet event. “A day before the event, we asked Linda to rehearse for the show but the producer was not satisfied with her performance and spontaneity. “So we asked her to rehearse again in the morning before the start of the event,” Nini said. Nini’s comments were carried in Kosmo! Era FM deejay Linda had been slated to co-host the awards ceremony with Channel V presenter Dominic Lau for Star TV but she backed out at the last minute, saying that she had not been allowed to wear the dress of her choice. She had planned to wear a black and white kebaya by Jovian Mandagie, an Indonesian designer, but was asked to wear an outfit by Malaysian designer Radzuan Radzi will instead - which she said was an unflattering skin colour, did not fit her properly and was too revealing. 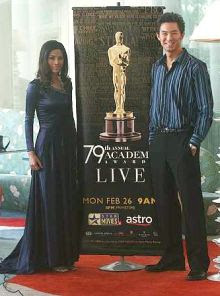 Linda also said that she received Radzuan’s outfit only an hour before she was due to leave for the Kodak Theatre. Nini, however, refuted this, and said the organisers had provided a tailor and hairdresser for Linda to make the necessary adjustments. Linda’s claims that Radzuan’s dress was revealing and not suitable to her body, Nini said, were baseless. What do you all think? The mention of the alternative dress in every news report about the controversy makes me believe that she was under pressure to wear it and not the one of her choice. As for Nini Yusof, Star TV’s associate vice-president for South East Asia, she should have dropped Linda Onn if she had doubts about her performance before Linda Onn ever arrived in Los Angeles. Now, whatever she has to say, only sounds petty and defensive. I do not believe that Linda Onn does not have spontaneity. She is after all not a stranger before the cameras. She does host her own TV show on Astro. Had she been a novice before the cameras, I may be inclined to believe the statement that her performance and spontaneity were not satisfactory. Just how difficult can it be to interview movie stars or anyone in the movie industry? There are usually so many interviewers representing TV and radio on the red carpet, and just how much time do you think each star can give you during the interview? You can be a non-English speaking Japanese interviewer with an interpreter, and I doubt very much if the stars care how you sound like or act like when you are interviewing them. Do you think the stars are going to ignore you especially when they are on live TV?! It appears to me that some people with powerful connections are trying to save face after being caught up in this controversy, and are now trying to cover their asses by putting all the blame on Linda Onn. I have no proof, but that is my sense. Claims made in a new documentary about the discovery of Jesus's burial site have raised some questions among believers and non-believers. As a believer, this news is just one of many and many more to come, to discredit the Christian faith. It is hard for me to take this more recent claims seriously. When the early Christians started preaching the gospel, their faith stood or fell with the claims of Jesus' resurrection. The following passage from 1 Corinthians 15, best summarises the basis of their faith, and our present day faith. Therefore, it is hard for me to believe that if Jesus had not resurrected from the dead, that the early Christians were able to spread the message of the gospel. Their claims would easily have been discredited and their message rejected entirely. And they were right that they should be pitied more than all men, if Jesus had not resurrected. But Jesus was indeed resurrected, and later ascended to heaven. There were witnesses to his resurrection and ascension (Luke 24:1-52). Bar-Ilan University Prof. Amos Kloner, the Jerusalem District archeologist had this to say about the claims to the Jerusalem Post, "It makes a great story for a TV film, but it's impossible. It's nonsense. .. There is no likelihood that Jesus and his relatives had a family tomb. They were a Galilee family with no ties in Jerusalem. The Talpiot tomb belonged to a middle-class family from the 1st century CE." Also according to Prof. Kloner, the "Jesus son of Joseph" inscriptions had been found on several other ossuaries over the years. It seems to me that James Cameron and Simcha Jacobovici are very good at stirring this controversy and therefore drawing attention and interest to their Discovery Channel documentary. Have you heard the reason why Linda Onn was a no show on the red carpet during the 79th Academy Awards? She was supposed to have co-hosted the red carpet show with Channel V's veejay, Dominic Lau, for Star Movies. But according to news reports some people were unhappy that she was going to wear an outfit by Indonesian-born designer, Jovian Mandagie. Who would those unhappy people might be? Read the unverified rumours, at Mr Manager's blog. He seems to know the low down on the controversy with the Jovian Mandagie outfit. I can understand why Linda Onn would rather pull out of the co-hosting job rather than bow down to pressures from spiteful people. I would not have succumed to the pressures though. I would tell them, yes, I would wear your design, but on the red carpet day itself, show up in the outfit of my choice! How's that for a slap in their face?! Linda Onn was not on the red carpet to represent Malaysia per se, but rather to do a job that was entrusted to her by Star Movies. Why should she be forced to wear something that "show cases" Malaysia's talent? Come to think of it, the Datuks and the Datins in Malaysia love to show off their foreign designer labels! I see them all the time wearing foreign designed clothes in the local magazines, especially in the magazine, Nona. I am sure there are some very talented designers in Malaysia but it is still up to the individual with the money to decide whose designs he/she wants to wear. I just hope that this incident does not back-fire on the designer who "wanted" Linda Onn to wear his outfit. One of my favorite past times, while surfing the web, is to look at other sites that show case their craft work. How I oohhed and ahhed at the beautiful work done by those people! I was quite inspired to do something more than a scarf after looking at the free crochet patterns at Crochet Pattern Central. I downloaded several patterns and of course I then drove over to Michaels and JoAnn to look for the necessary yarn. I even ordered some yarn from Lion Brand when I came across a pretty pattern there. The reason I have put off crocheting is that I have difficulty following the pattern instructions. What do I do? Buy "how to" crochet books of course! :-) I bought three books from Amazon, books with lots of illustrations of course! Even with those books, those pattern instructions are not that easy to understand. Anyway, the yarn I ordered from Lion Brand has arrived and I can't wait to start on a jacket with it! But first, I have to finish the tank top that I started using micro spun yarn by Lion Brand. Errr, it is coming along, but not as great as I would have liked!